There’s an event going on – you really wanted to attend, but you couldn’t make it. This time you’re in luck – some thoughtful people are live blogging and live tweeting the event. You can follow their reports – and if you want to know more, you look up the presenters, key terms and concepts. Maybe the event itself is a research moment – planned or serendipitous? In this situation the tweets and the blogs might be useful data – how might you capture and analyse these? To use a recent example, the good people at the Wellness Network for Law held a forum at the Australian National University in Canberra during 5-6 February 2015. 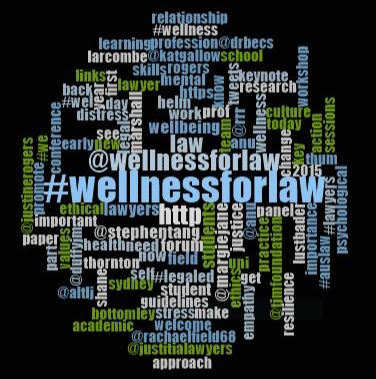 Regrettably I could not attend – I’m working on the end phase of my PhD candidature – but I was able to follow the forum on Twitter, by following the #wellnessforlaw hashtag, and reading Paul Maharg’s live blog posts. Because savvy people at the forum took care to include the hashtag in their tweets, I was able to compile a comprehensive Storify of tweets from the Forum. This gathered all the hashtagged tweets in one place, and made it possible to view them as a slide show (along with attached images). It is a bit like attending a meta version of the event! It is also an easy way to archive this version of the event for future reference. So the forum provided a great opportunity for individuals and organisations to network and share information and ideas around the theme of wellbeing in law. It seems to me, however, that the event as an event, was significant and could be studied. The focus on lawyers and law students’ wellbeing is a relatively recent phenomenon in Australian legal history. Might it be fruitful to study the event itself – consider the concepts and themes emerging from it, and ways in which they align, complement or conflict. What underlying beliefs or discursive operations might be rendered visible. 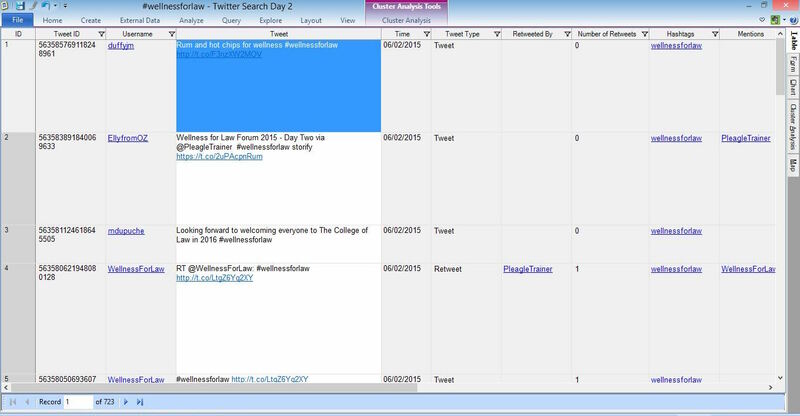 Could we use the hashtagged tweets as one data source in this context? It is possible to “code” rows, columns, and cells to a “node” as a case, concept, or theme. A node works like a bucket to hold all the items coded to that concept or theme. For example, I selected the dataset column “Tweet” and coded all the items contained in the column to the node, “Tweeted Text”. I could then open the “Tweeted Text” node to read through the tweets and then “code on” for concepts and themes discerned within the tweets. I could pick out words of interest from the visualisation, run a word search on the dataset, then code on from those search results. 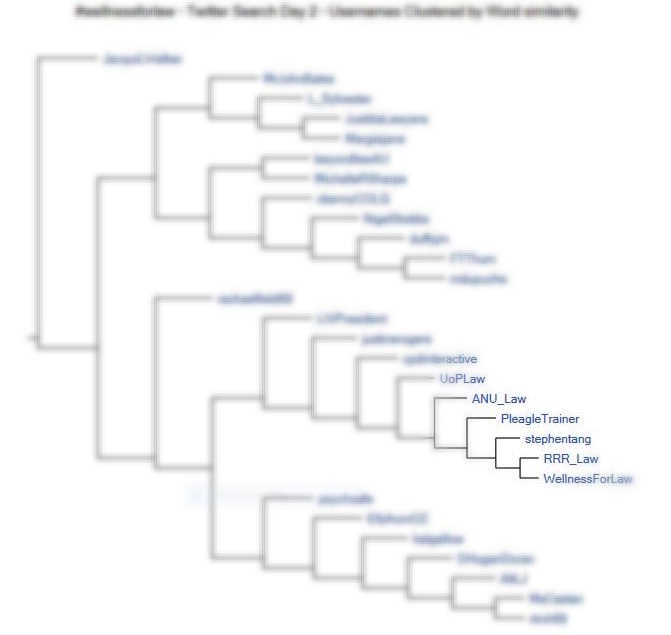 Here, the image is deliberately blurred to obscure twitter names save for mine (PleagleTrainer) and those associated with the forum. The cluster analysis compared all the tweets by username using the Pearson’s R correlation coefficient to generate a table of pairs. A complete linkage algorithm is used to create the dendogram above. The items that are paired are the most highly correlated in a cluster. Other items in a cluster are also correlated, to a lesser degree of similarity. The same applies to items in other clusters. Such analysis proves nothing by itself – but it might prompt me to return to the tweets associated with paired and clustered usernames, to read them and discern whether they share concepts or themes, and how these might compare with items in other clusters. This might lead to further reflection and analysis before writing up conclusions. I wasn’t able to attend the event, but I was able to participate in the meta-event, and if I chose, I could use that meta-event as data to learn more about the forum’s subject matter, but also the forum as an incident of social action in legal education. I think we can plan to be a bit meta, plan for reflexivity, when organising and participating in social action in legal education. This entry was posted in Blogging, conferences, Legal education, Research, Twitter and tagged blogging, legal education, research, social media, Twitter. Bookmark the permalink.